Rank 1 – LED There Be Light The one and only Trance Energy Theme from this year and also the best TE theme there has ever been. Evil Angel ft. Kim Marsh – Today (Alphazone Dub Mix) Amazing piece of progressive hard trance, fast and smooth. Solarforce – Kaleidoscope One of the favorites by TranceDevotee. Best piece of progressive trance I ever heard. Dream Dance Alliance – Ayers Rock Another wonderful song by DDA. Dream Trance at it’s best! Lee Haslam – The Future Another favorite from TranceDevotee. Outstanding melodic hard trance. Dj Merlin & Dj C-Bass – Trancemission Banging hard club trance anthem! Cosmic Gate – Conscienceness This dope psytrance track proves Cosmic Gate can handle anything. Technikal – Terminal Velocity Best beat ever, sick melody! Hard trance by Technikal the way we love. Wavetraxx – A New Day Wonderful melodic progressive trance, I love the melody! A shot rings out from somewhere upstairs." 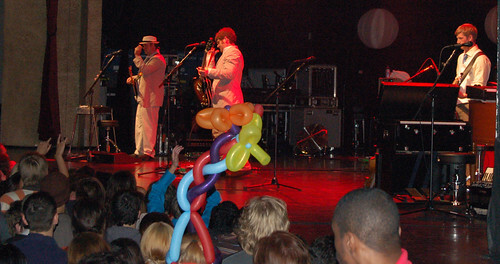 For the 1st encore song, Jenny Conlee (organ, concertina, etc) was wearing that crazy balloon hat.